Before watching this Day Trading Strategy Video we must strongly recommend that you watch the video General Tips first. This is to protect yourself against losses or at least minimize them. For example the importance of using a simulator and trading minimum position. The MACD Stair Step Strategy uses 2 components which are the MACD of course but more importantly the Stair Step pattern. 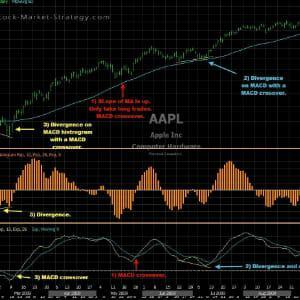 If you are not familiar with the MACD indicator I strongly recommend that you watch our free video explaining the MACD. We are explaining the Stair Step pattern in this video. MACD is used for the trigger itself. When the MACD Line crosses up trough the Signal Line which is the 9EMA it triggers a long signal. When the MACD Line crosses down through the Signal Line it triggers a short signal. The Stair Step is the main component in this strategy whereas the MACD is simply just the trigger that alerts the trader to enter. It is the ability to spot the correct Stair Step pattern and thereby the right market conditions that determines the success of this strategy. The requirements for the Stair Step pattern is that in an uptrend the swing low is formed at or above prior swing high. So what was resistance is now support. The second requirement is that price pulls back in a controlled manner. Not a sharp selloff down to form the swing low. The strategy in simple terms is enter long when you spot a Stair Step pattern where price is pulling back slowly and forms the higher swing low above prior swing high. Then wait for MACD to cross over 9EMA Signal Line. Stop below the swing low and calculate target by measuring the prior move and project that from the swing low. You can increase the overall success by only trading with the bigger trend and also by only taking the first setup in the Stair Step uptrend. This is because the longer the trend the closer we are to the end of the trend. This strategy just like any other strategy is HIGHLY dependent on the right market conditions. Some examples of how to avoid the bad market conditions are not to trade around holidays as volume is low. Also do not trade around major news such as FED announcements. It is time to take the day trading exsam! Do you think your good enough to trade these day trading strategies?